What better way is there to enjoy your salon experience? And what better way for us to show how much we appreciate you than through a salon membership?! If you like salon services, need them on demand, you expect great services and ah-mazing value from each of your visits then… Our memberships will allow you to get just that. Smart beauty - With different options to suit you needs you can tailor your membership to your lifestyle! Our VIP options get you extra special treatment with every appointment! Enjoy discounts on treatments AND retail. A surprise complimentary monthly gift! And first in line to test out and try our newest services and formulations from the chemist! This is THE best way to experience a salon! Nothing makes you feel more empowered and ready to take on the world like a great blow-out! Not only can you get unlimited blow-outs during the month you will get 20% off any hair services you need as well! This membership is exclusive and limited in availability for subscription. Enjoy 20% off all other services booked in AND retail! The membership for those that want it all, and believe us… You can have it all! Unlimited color every month (any natural colors you want) and even a glaze or toning shampoo and conditioner in-between, blow drys each week. 20% off all other treatments, services and retail. Some restrictions apply. No fashion or fantasy shades or corrective work with this membership. But don’t worry, you can still get them and your membership will get you 20% off!! All our core color options are available for this membership! See sales associate for details or you can message us on fb or email us for more details. There is very limited in availability for subscription! Only 5 will be allowed out at a time per month! First come first serve. Add on Infinity ∞ Blow-Outs for only $50 more! Details in salon. Our core membership for color. This membership includes root-to-end color and a cut every 6 weeks. You can choose to balance your color every time, have a dimensional pull through (can help fadeout look more intentional) or you can opt in for a deep conditioning or shine treatment instead. This is ideal for you if you rarely get highlights or balayage. You also enjoy 15% off of all other service book AND retail. (Just in case that rare highlight urge hits you). The ultimate “Build Your Own Membership”. We all like to get what we want when we want it… So, you tell us and we’ll get you the membership of your dreams. The way it works, choose the number of colors you would like to get 1, 2 or 3. Next choose your preferred time between appointments 4, 5 or 6 weeks. 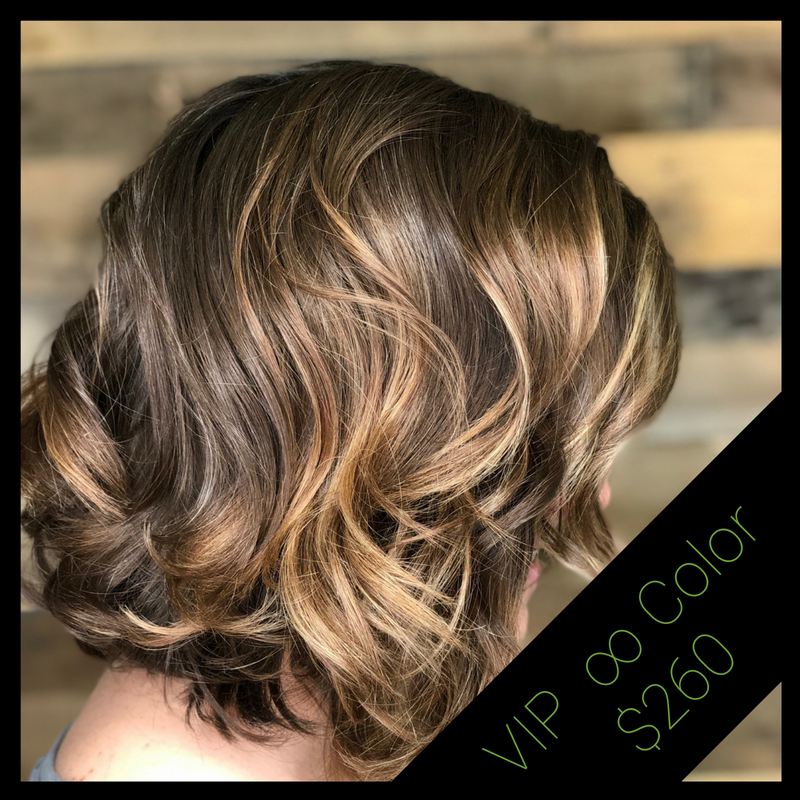 (This membership is ideal for those that like dimensional colors such as highlights and low-lights, if you just need roots to ends color see our “Constant Color” membership. Tips for choosing. If you like base color with highlights/lowlights every visit then this membership is for you! Each service is one color. Root touch up, highlight, lowlight or glaze. If you’re only getting foils or balayage a few times a year but you are regularly touching up your base and getting glazes you can check out our Constant Color Membership or our Balayage Membership. *With any 5 and 6 week option you can enjoy 15% off all other services booked in AND retail. With any membership at 4 weeks you have become a VIP member and enjoy 20% off all other services booked in AND retail. 4 week options- choose how many colors you'd like. 5 week options- choose how many colors you'd like. 6 week options- choose how many colors you'd like. Here we go! This is by far our most popular service (so naturally we saved the best for last). Balayage is low maintenance, so they say, but really to keep all that dimension beautiful and shiny you need glazes, trims and the occasional face framing highlight to refresh the whole look. This membership gets you in every 6 weeks with 8 appointments for the year. You get 2 full balayage appointments, 2 mini balayage appointments, 8 glazes, 4 haircut and styles, and 4 blow-outs. You also enjoy 15% off of all other hair services booked in AND retail! To enroll you must have a valid drivers license/ID and credit card. First and second month are due on signing. Payments will begin 2 (two) months to the date after signing. Recurring payments are required. (Unless paid in full). You may use our recurring payment provider in salon or you can use PayPal. (PayPal is ideal to manage and maintain you payment methods and subscriptions). Services and discounts may not be moved from one month to the next. Services and discounts may not be transferred between people. Services and discounts may not be transferred or changed outside of package. Complementary services are subject to availability and require an appointment They may not be carried over from month to month. Infinity Blow-Out memberships services are available Tuesday - Friday. Saturday appointments are available for a $10 cover. It is highly encouraged to prebook ALL membership services. To move or reschedule a service we ask that you call us 48 hours before. No showing a scheduled service will forfeit that service for that month. Membership price does not include gratuities. Members will receive 10-20% off all other services booked. Based on membership subscription. Members will receive 10-20% off all retail. Based on membership subscription. 20% off services and retail is reserved for VIP memberships and Tier 4 of the Color Construct Membership. Memberships require a 2 month commitment. After that you may cancel any time. Memberships will auto renew each month on designated date. Memberships will auto renew annually. Failed payments will be called and given 3 days (72 hours) to remedy the payment. Memberships can be cancelled after two months with written notice, or you can call us 234-208-8226. VIP memberships will be limited at enrollment. A certain amount will be up for purchase each month and it will be first come first serve.